FourVerbs is a vocabulary building game that lets you learn new verbs while you correctly identify verbs you already know. Verbs are a part of speech that convey an action (bring, read, walk, run, learn), or a state (exist, stand). 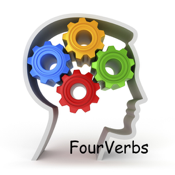 FourVerbs presents a brief description that matches one of the posted four verbs. Just tap the verb that matches the description. A complete description of the correct verb is available in a Scores & Info view. You can keep track of your progress with the saved results shown as a percentage of correct choices. Discover the mental "tricks" that will allow you to recognize new verbs in seconds! Challenge your friends to beat your best percentage. NOTE: Because FourVerbs randomly access a very large dictionary of verbs occasionally an explicit, rude, or suggestive verb will appear. We strive to filter these verbs but occasionally one of these inappropriate verbs gets past our filter. Please contact us for any additions to the filter that you'd like to see.